S&B PARTICLE SEPARATOR SOUND SYSTEMS & ACC. For use on VP Motorsport Containers or Sportsman's Containers. 14" hose assembly with cap. These tubes have clamps that keeps gas from leaking like cheaper brands. Available In 1 in. 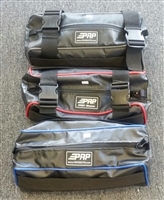 x 6 ft.
PRP’s Buggy Bag is made of durable, vinyl coated nylon with colored piping and measures 7” Diameter x 13” Long. Use this boot during a race or out on a weekend when you don’t have time to change your boot. This will help keep rocks and sand out of your CV until you have time to change your torn boot. They are very easy to install with hook and loop straps and you don’t need to remove your CV. 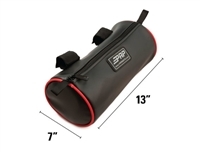 This low profile tool bag bolts to your vehicle with heavy duty 1″ straps and easily unsnaps to carry it where ever it is needed. Bolt the heavy duty 2″ webbing straps to your vehicle and easily unsnap the bag to carry it where ever it is needed. Made with ¾” foam and a vinyl cover. Fits most after market UTV doors. Separate pockets for better organization and less digging. Measures 24″ wide and 8″ tall. Also available with a Single pocket. Each 2 gallon Patent Pending Cam Can unit. Purchase mounts and cams to store your Cam Can in the garage or on your trailer Utv Jeep 4x4. The compact size allows the Cam Can to fit easily within the diameter of a 15-inch wheel, and it can be removed in seconds using built-in handles. The center lockable shaft is available in two lengths to accommodate up to two Cam Cans, using the lock of your choice. 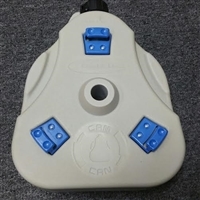 Rotational Molded Paxton 7000 Series Polyurethane Resin is used to manufacture each Cam Can, providing protection from harmful UV rays and drops that can cause leaks. Available colors/options include: Red CARB Approved with spout for gasoline, Green for any non-fuel liquid or Grey/Blue for potable water. Daystar also offers an L-bracket specifically designed for UTVs.